When we purchased our home we chose to get the "appliance package" and some other things instead of "decor dollars". Maybe it wasn't the best choice, but it was our first time buying a house and it seemed to be the best option. At the end of our first appointment with the builder (you can read more about it here), we received the voucher with the address of the store. We went to the store and the lady was really nice. She explained everything about the appliances we are getting. In summary, we are getting a refrigerator, a stove and a dishwasher - all Frigidaire Gallery. 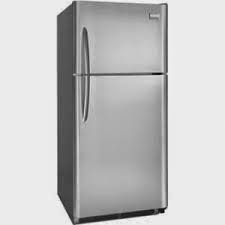 I guess I am ok with the stove and the dishwasher, but we are considering an upgrade for the fridge. We think it might be too small so we are considering upgrading to a bigger one - 28 cu. 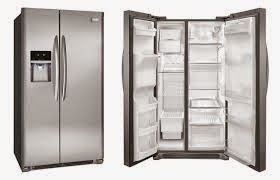 To be honest, I don't know if we should choose a side-by-side or a French door fridge. Which one is the best option? 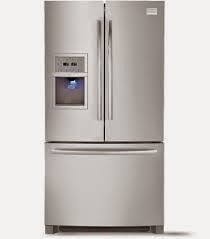 Should we go with Frigidaire? Get the french door one! Go with a french door, the side by side doesn't even fit a frozen pizza box. 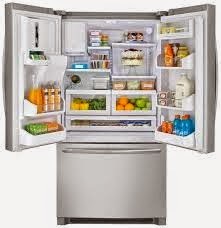 and you also get a narrow fridge on the side by side. Hope it helps, Lu. That is a good point. Thank you Lu!